Did you know that "Edelstein" is German for gemstone? It is obvious now looking at the color names - Ruby, Sapphire, Jade, Onyx, etc. - but somehow I remained oblivious. Tell me I'm not alone! Edelstein Topaz is a wonderful shade of blue. It has great depth with lighter shades showing through that make it pop off the page. It has none of the green tones found in many turquoise inks either, which is something I prefer not to see in my bright blues. 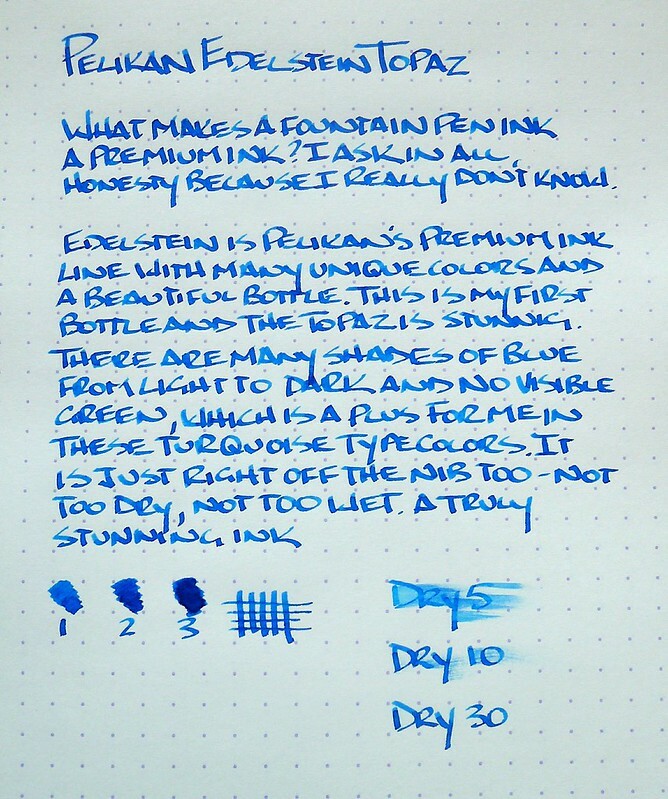 What is does have is an excellent sheen, something all Edelstein inks are known for. Topaz has a reddish-purple tone on top of the ink when it dries. It was hard to capture on my writing sample but look at the bottle rim in JetPens picture above and you can barely make it out. That's all it is on the page too. Subtle and beautiful. While it didn't make my Top 5 fountain pen inks it makes the next five without question. It is silky smooth in all nibs, even fine ones like in my 03 Platinum Plaisir. I ink it up whenever I get the chance. Posted on November 25, 2013 by Brad Dowdy and filed under Edelstein, Ink Reviews, Pelikan.